It was a strange summer for me this year; our beautiful old Irish wolfhound, who had been such a major and joyful part of our lives for almost ten years, died in early July. Hence the blogging break for a couple of months as I came to terms with that and all the ensuing changes. Not only that, it was extremely hot and dry – the third hottest summer on record here, and the driest in over 50 years. I almost gave up on the garden as it shrivelled and burnt, with temperatures in the mid-30s all through July and August (apart from just a couple of cooler days in between.) We do not have a well in our garden, since we live on a very rocky hill, so watering long-term is not an option. But then a last-minute attempt to save it with several evenings with the sprinkler proved a success and almost everything survived! Even my new dwarf Buddleia “Buzz Velvet” rewarded me with flowers after the first buds had been singed and failed to open. Although the heat forced me to be physically inactive, I did spend some quality time with my family, partner and our other dog. I also leisurely browsed blog posts, admiring your beautiful vases and gardens, while my fingers were kept active crocheting – yes, a new hobby of mine. My summer project was very calming, inspired by Eliza when she posted a vase photographed on a beautiful vintage pansy doily (Eliza’s Doily) in June. (Thanks again Eliza!) My sister helped me immensely, actually tracking down the original pattern in a 1949 pamphlet that some kind soul had scanned in and put on the internet! 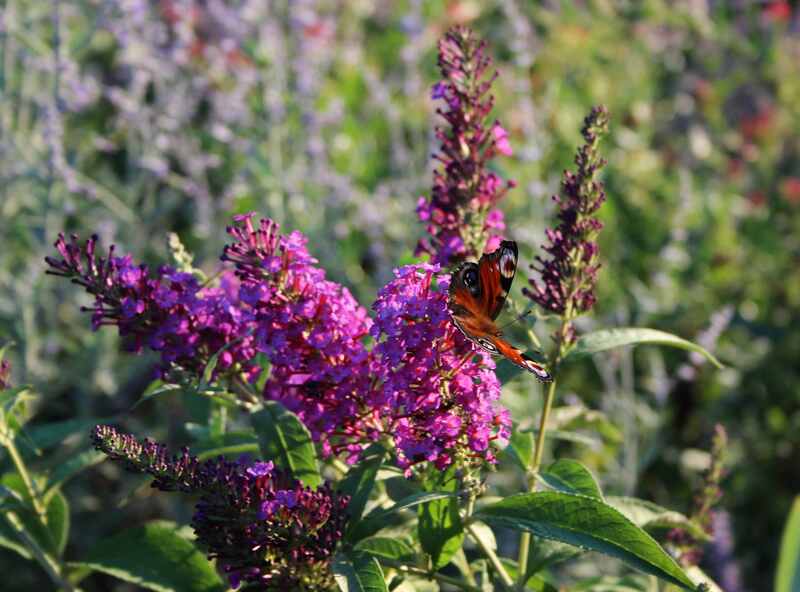 Another of Eliza’s posts was simply magical – do take a look at it here before summer is over: Lazy Summer Afternoon . 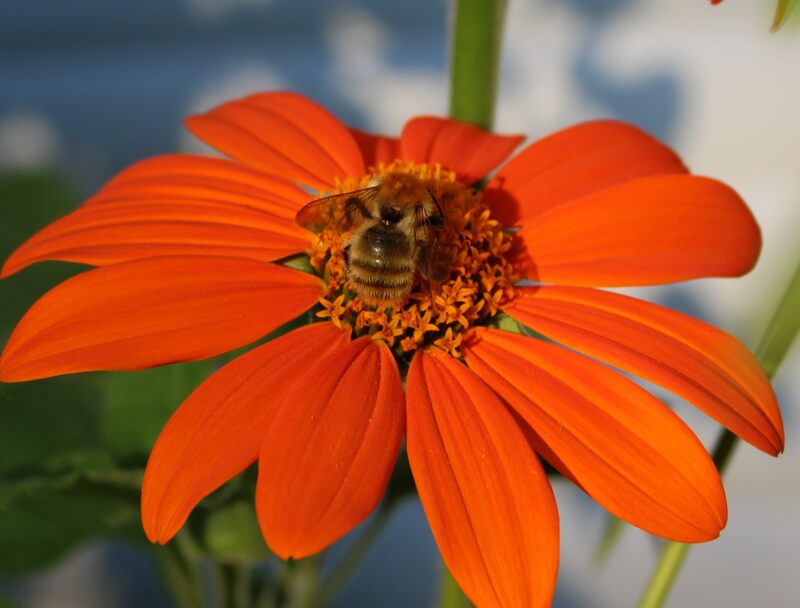 I thoroughly enjoyed all of Jason’s Tithonia posts this summer (Garden in a City) where he showed us his Mexican Sunflowers getting taller – I just love the way he describes how he deadheads them and would like someone to ring a bell each time he snips off a dead flower! (Jason’s Tithonias). A big thank you Jason, for introducing me to this plant last summer. 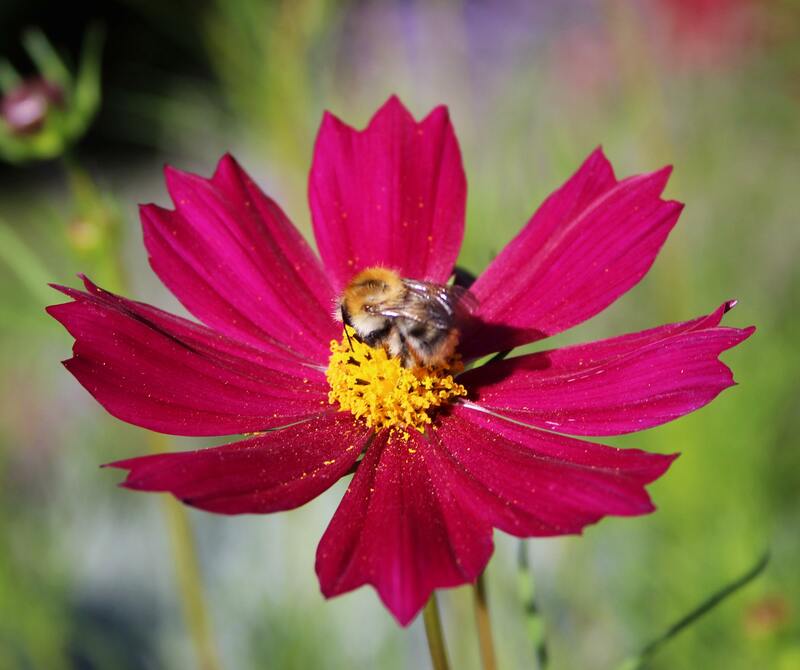 I grew mine from seed and absolutely adore them – as do the bees and other insects! I also enjoyed reading about Cathy’s challenge to herself to not buy any plants next year… one I will not be joining in with as I do not have that same self-discipline but also because I need to make changes in the rockery to grow more drought-tolerant plants. Good luck Cathy! Then I followed Christina’s plans for changing her view from her terrace – which she is already putting into action. Her planting has inspired me over the years, as she also has very dry summers and long periods of intense heat in her Italian garden. Annette’s Book, “Gartenträume”, has finally been published. Sadly it is only available in German (at the moment?) but I am taking great pleasure in reading about the gardens she has focused on – including her own. Exquisite photography and a truly wonderful way with words makes this a joy to read. Well done Annette! If you speak German then do take a look at it here. Weather watching from a Scottish Croft Garden, glimpses of a Norwegian summer, Monday vases (Wild Daffodil gave us the tip to type in “In a vase on Monday” in Google Images – what a lovely sight! ), butterflies and rainbows, hummingbirds and bloggers’ flings, all kept me well-entertained during my break. So THANK YOU fellow bloggers! Hope you all had a good summer, and thanks for dropping by. 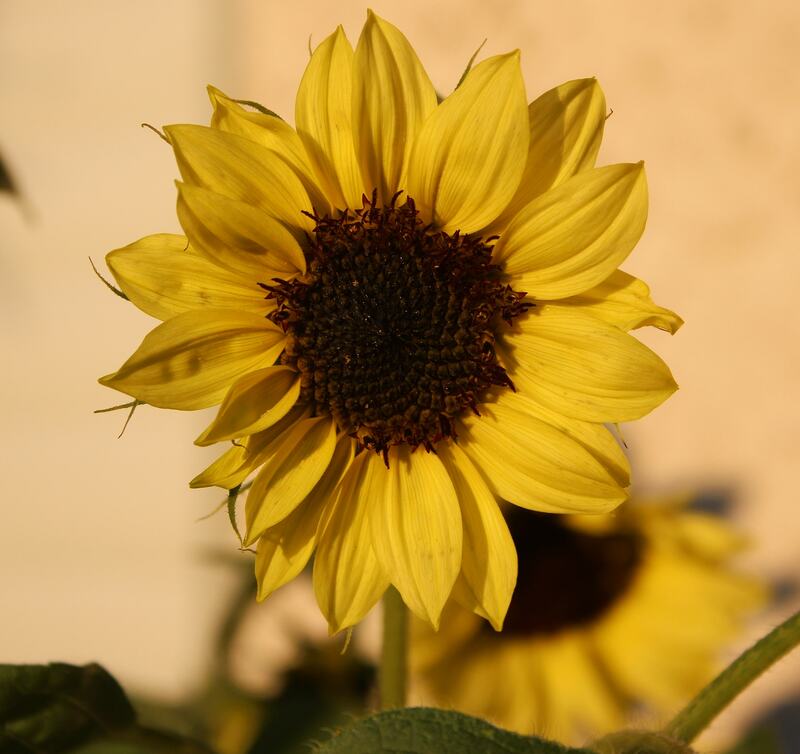 This entry was posted in Garden, Plants, Random Thoughts and tagged Garden, Plants, Seasons, Summer. Bookmark the permalink. What a lovely post. So sorry to hear about the loss of your beloved hound, it takes a while to readjust doesn’t it. This post is such a wonderful Bloghop – I will return to it til I have read all the links – I just joined Eliza on her river bank – fabulous! And thank you for the link to Wild Daffodil. Wishing you a wonderful Autumn. Thank you for such kind words, and hope you have a lovely autumn too! this was a long summer. Autumn will bring peace. I love your crochet! Thanks Uta. I’m enjoying the cool September weather so much! It is always sad to lose a faithful friend but I’m sure he had a good life with you. Thank you for the link, and yes the first part of the new planting is almost in place. Thanks Christina. I’m looking forward to seeing how the new view is progressing! Cathy, I am so sorry to read your beautiful Irish Wolfhound passed away, dogs are such faithful loving companions, I agree with Christina, I am also very sure he had a good life with you. Your other dog must feel a little lost too. Glad to read though that your garden bounced back after the drought, incredible how resilient some plants are. Thanks Julie. Our little dog was, as you say, quite lost without her big sister for a while. But I think she is now enjoying all the extra attention she has got. I was quite amazed anything had survived at all after a 2-week break in England, but yes, some plants are so very resilient and the light rain we have had the past week has given everything a new lease of life. Now I know approximately how old mine is! So sorry to hear about the loss of your beloved hound, after having lost my ‘girl’ last October, I know the hole they leave in your heart. Healing takes time. Sounds like your summer was a bit brutal, sounds like maybe soaker hoses and more mulch might be in order next summer. However, with the crazy weather we’re having globally, it might be the opposite extreme next year. 😉 Your images show a fair amount of success despite the lack of rain. Nice to have you back in the blogosphere, Cathy! Isn’t it horrible when we have to say goodbye to a beloved pet? They become such valuable and loved family members. I’m so sorry that you have been going through a sad time. That is a beautiful doily. Welcome back to the blogosphere. You have been missed. We’re so sorry to read that your beautiful Irish Wolfhound passed away, Cathy. Our heartfelt condolences. I had an Irish Wolfhound,Molly. They leave such a big gap in your life when they go. So sorry to hear you have had such a sad summer. Nice that you are back in the blogging world. Thanks Chloris… then you understand too how special Irish wolfhounds are. Blogging is definitely a good antidote and has got me back out with my camera too. Thanks for all your kind words Lindsay. I love the sound of different shades of Tithonia. Could you tell me where you got your seed from as I have only managed to find the orange sort so far. Thanks! Welcome back and have a wonderful autumn, Cathy! Thanks Anca, and the same wishes to you too! As they say, time heals Amy…. and the crocheting was very therapeutic too. 😉 You will love the Tithonia! My condolences on the loss of a beloved companion. I’m so glad, though, that you discovered the joys of Tithonia. They love hot weather, so I’m sure they were happy in your garden this year. And thank you for the link! I honestly wasn’t familiar with the breed Irish wolfhound so of course I googled it. What a huge package of personality and love. I’m sorry you’ve lost your special pet Cathy. Your crochet is impressive. Thank you Susie. Yes, wolfhounds are said to be gentle giants and it is so true. They are also incredibly loyal and loving. Pets become so much a part of our lives. They are such wonderful friends! May the pain of your loss gently be replaced with sweet memories. Our gardening has changed too, this is the fourth year of drought in California. Our small vegetable garden is watered by drip, and sparingly at that. Thanks Deb. The good memories have already been flooding back. 🙂 We intend to put in a large tank at some stage to collect the winter rain from the roof for use in summer… but it will be a major project for a future date! My condolences on your loss. Beloved pets bring us such joy and sadness too, but much more joy than sadness. It’s been hot here too. It’s hard to take the “brown-ness.” I know the coming of Autumn is going to be celebrated by many. Oh I am so sorry to hear of the loss of your dear hound Cathy. It must have left you very heavy hearted. 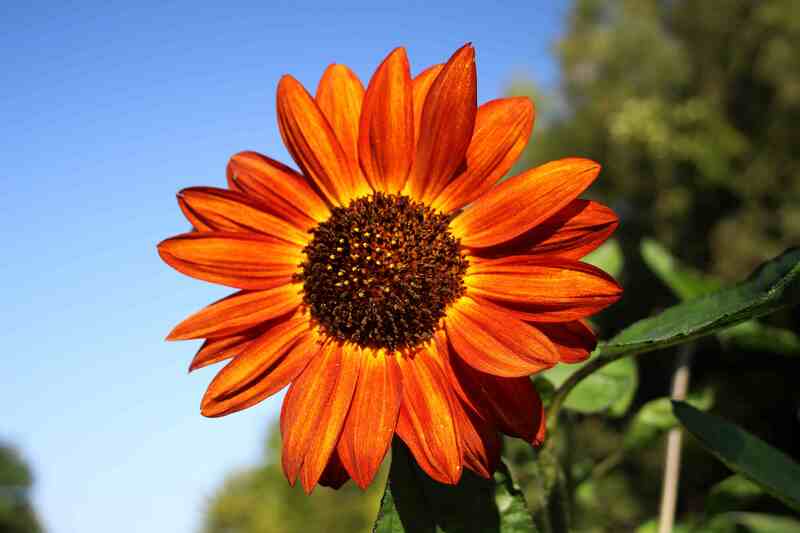 Your garden has done well to survive the searing temperatures without any major losses. Is it cooling down now? Your crochet mat is fabulous – are those little pansies round the edge? Creating it must have provided a welcome and therapeutic diversion over the summer. You’ve been busy! Glad that the dry heat of summer is fading, we just had a nice rainy day here and things seem to have breathed a sigh of relief. Thanks Frank. My garden also bounced back after the first rain and cooler temperatures at the beginning of the month. We could still do with some more moisture though! A summer of extremes indeed. I think I will take extra pleasure in autumn this year after all that heat! Good to see you back Cathy, but so sorry to read about your loss – it’s hard to lose a pet when they’ve been a part of the family for so long. Your summer weather sounds to have been much more summery than we’ve had here – I love your photos… especially the bees on the flowers. Thank you Sarah. The bees have been very busy all summer and now that the sedums are opening it is buzzing out there again! 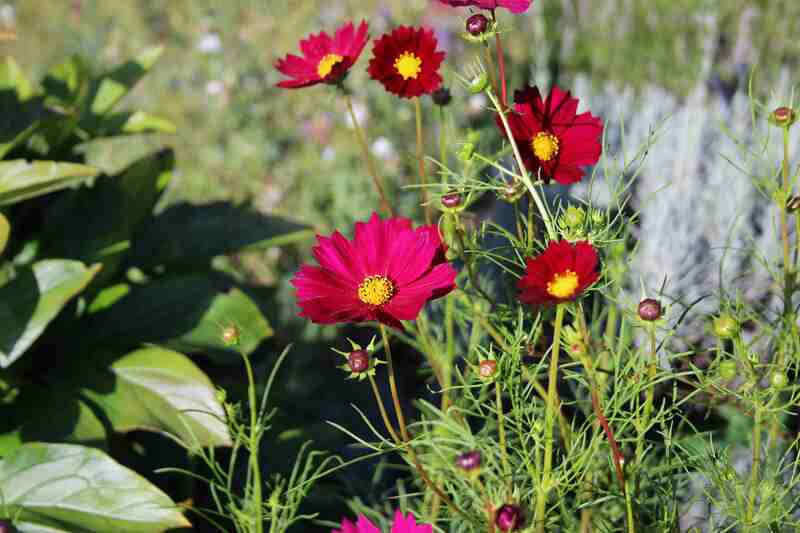 The Tithonia and sunflowers were a great attraction, and the cosmos too, which surprised me. Our dogs do become such an important part of our life, I am sure yours had a good life with you. The garden is looking very colourful following the hot summer you have experienced this year, we could have done with some of it over here. Thanks Brian. Yes, our wolfhound certainly had a happy life here with us and loved being outdoors in our garden all year round. I would have gladly sent you some of the heat we had in July and August, but temperatures are now much more pleasant and I can finally get out and do some tidying up! Hello Cathy. 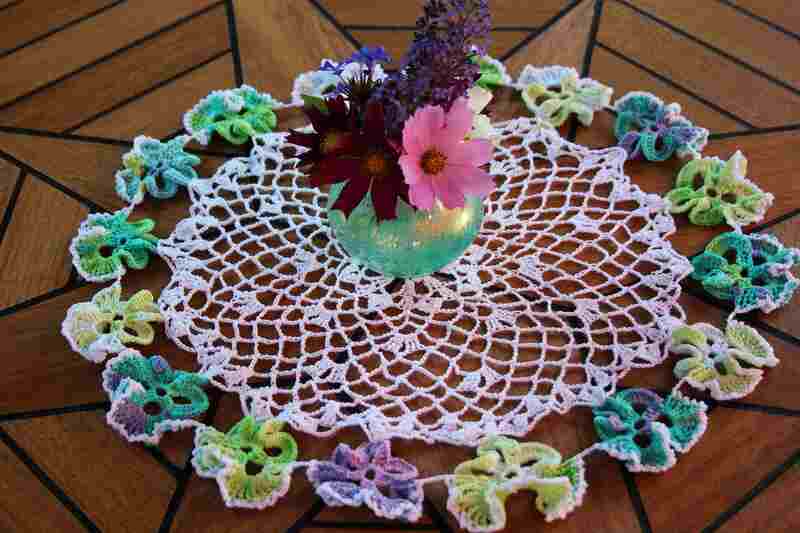 I dropped by via Eliza’s lovely blog, to see your crocheted pansy doily, which is just beautiful! I love the variegated yarn you have chosen, and now you and Eliza have inspired me to find, somewhere in my stash of unfinished projects, the same doily which I began crocheting back in the late 1970’s! I’m so sorry to hear that you have recently lost your dearly loved fury friend. We lost our Tess, a Rottie, about eighteen months ago, and my eyes still well up when I think of her. It must help though, having another dog to pour your love into. I have two cats, and although they are not the same devoted and loyal beings that dogs are, I love them both so much and would be lost without them. Hello Joanne. So nice of you to drop by! Now I do hope you find that doily – I really enjoyed the whole process, choosing the yarn and studying the pattern with my sister. And then the concentration while working on it was real therapy for me. Thanks for your kind words too. Yes, our other little dog has been getting lots of extra attention and tries so hard to fill the gap! Hoping things level out for you Cathy…losing a cherished pet is a huge blow, and very heartbreaking. It looks as though you certainly made the most of the summer and love the new hobby. Here it was one of the hottest and quite dry at times…good to hear you did not lose your garden plants.